A Woman Is Reunited With 2 Gorillas She Grew Up With After 12 Years.. THEY REMEMBER HER! 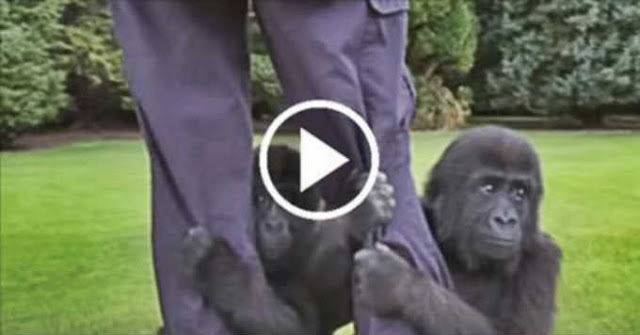 Home » other » A Woman Is Reunited With 2 Gorillas She Grew Up With After 12 Years.. THEY REMEMBER HER! Damian Aspinall, a world known conservationist, began searching the thick forest of Gabon for two gorillas he released 12 years ago. No one knew if he would even be able to find either of them, let alone if they would be friendly. After days of looking, the two faces emerged from the trees as a response to his calls. The two apes who were born in captivity, remarkably are still together after all these years! They instantly remembered the person who saved them, but watch what happened when they met Tansy, Damian’s daughter who was only a baby when they last saw her! Seems like animals don’t just remember our looks but our energy too. How we feel to them. And the fact that these apes can still remember Tansy’s feel, after 12 years, it’s beyond comprehension! It’s like they fall in love with something essential deep inside our soul, something pure that’s always there no matter how old we get, the true version of us.